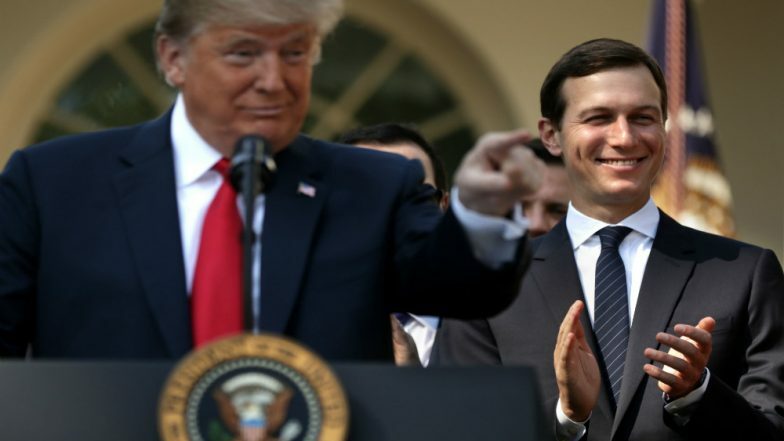 Toronto, April 16: Jared Kushner, senior advisor to US President Donald Trump has been working on a peace plan for Israel and Palestine but according to a report in the Washington Post, the ‘deal of the century’ does not include a sovereign Palestine state. The plan is expected to be unveiled some time later this year. According to the report, the Kushner peace proposal "does away with (Palestinian) statehood as the starting premise of peace efforts". Instead, the proposal will focus on building major infrastructure and industrial work, in the Gaza Strip. US President Donald Trump has often referred to his son-in-law Kushner’s work on the Israel-Palestine crisis has the “deal of the century” but Trump’s policies since assuming office have favoured Israeli positions on most issues. For example, Trump officially recognised Jerusalem as Israel's capital in 2018, and moved the US embassy from Tel Aviv to Jerusalem. "What we've tried to do is figure out what is a realistic and what is a fair solution to the issues here in 2019 that can enable people to live better lives," Kushner said in an interview with Sky News Arabia during his visit to the region in February. Kushner’s proposal links Arab recognition of Israel and acceptance of the status quo with the Palestinians being granted "autonomy", as opposed to "sovereignty". Speaking along these lines, Jason D Greenblatt, who would be the lead US negotiator for Israel-Palestine talks, tweeted a direct appeal to Palestinian leaders last week. "To the PA: Our plan will greatly improve Palestinian lives & create something very different than what exists," Greenblatt wrote. "It's a realistic plan to thrive/prosper even if it means compromises. It's not a 'sell out' - if the plan isn't realistic, no one can deliver it." However, it is highly unlikely that Palestinians will agree to any deal that does not guarantee them full statehood as the Palestinian Authority cut off all official contact with the Trump administration in December 2017 after it first recognised Jerusalem as Israel's capital. Palestinian leaders have for long said that part of Jerusalem would form their capital in a future Palestinian state.